The Addison Gallery entryway to From Starfield to MARS, the work of four photographers in residence at the Manship Artists + Residency Studios. Pictured here: two sculptures from the Addison Gallery of American Art collection by Paul Manship: Diana (l) and Actaeon (r). Four photographers will continue the work of a sculptor. Who knows what kinds of artists will follow them. The four photographers—Barbara Bosworth, Justin Kimball, S. Billie Mandle, and Abelardo Morell—were all in residence over the past year at the Manship Artists Residency + Studios (MARS), the revitalized estate of the sculptor. The Lanesville property, covering fifteen acres with two large quarries, has been transformed into an artist’s retreat, and this exhibition is the first result of that transformation. Paul Manship (1885–1966), and subsequently his son John (1927–2000) and daughter-in-law Margaret Cassidy (d. 2012), all lived and worked on the grounds. After Margaret’s passing, the estate went into trust, and a group led by art historian Rebecca Reynolds has worked on its transformation into artist residencies. Repairs to the Manship home and studio are still ongoing, but these four photographers still came for a year-long exploration of the grounds. Each worked in unique ways. Bosworth made long exposures of the night sky. Kimball’s color photographs captured remnants of the Manships’ previous work. Mandle focused her attention on discarded paintings by John Manship, and Morell chose an “oblique response,” as he put it—creating cliché-verre symmetrical patterns. Emotion and a strong sense of the past inform each of the four photographer’s approaches. Bosworth’s dark exposures of the night sky—offset with a series of details taken of sky images from paintings in the Phillips collection—makes Starfield seem like a cosmic fulcrum. The wall of black images, confronting a facing wall with details from paintings by Childe Hassam, Winslow Homer, Fitz Henry Lane, Anne Parker Wigglesworth and others—seems like an frank challenge to artists from the past and the present. Morell’s cliché-verre—a technique of manipulated glass negatives—brings Navajo, Tibetan, and art nouveau history into the mix. Enormous symmetrical patterns, the photographs hardly appear to be that at all—they feel more like images of ancient tapestries. Kimball’s color photographs are carefully posed narratives, which seem at first glance to be random shots of storage closets, guest rooms and incomplete projects. And Mandle’s striking compositions strongly juxtapose her own personal aesthetic with the Manships’ more public notions. Queering the perspective, Mandle puts Paul Manship’s very visible work—public sculptures, muscular and active, seen in common spaces around the world—in a different light, without even showing them. She examines corners, shadows, and forgotten, half-completed projects, adding private footnotes to the public record. Her work feels personal, real, and necessary. The vitality of the four photographers’ work creates promise for the future of the artist colony. Cape Ann has long been home to painters, sculptors, writers and others; with the newly renovated Starfield (Manship’s own name for the estate), now there is place for international artists to visit, spend significant time in residence, and further the creative conversation, as these four photographers have done. 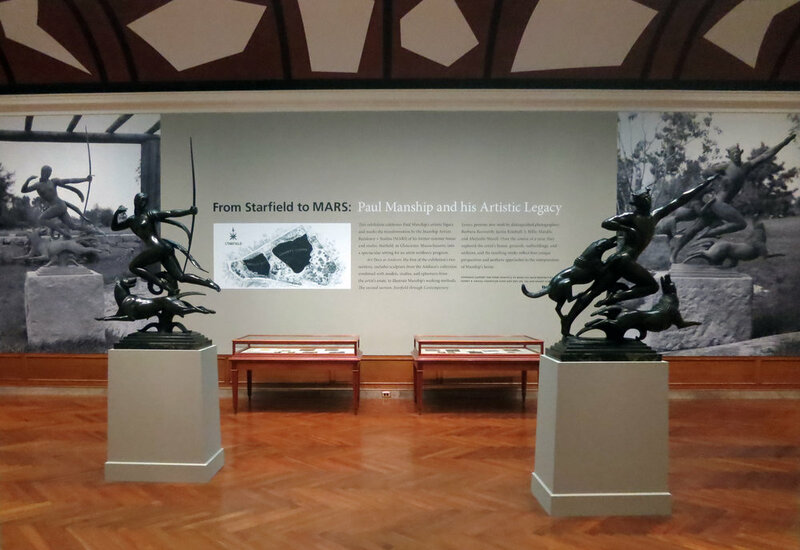 “From Starfield to MARS: Paul Manship and His Artistic Legacy,” remains on view in the Addison Gallery of American Art at Phillips Academy in Andover through Jan. 20. Visit www.addisongallery.org or call 978-749-4015. Tickets: Free. Visit www.addisongallery.org or call 978-749-4015.